We all know that dogs are man’s best friend but, the past few weeks, Tanner has been going above and beyond. 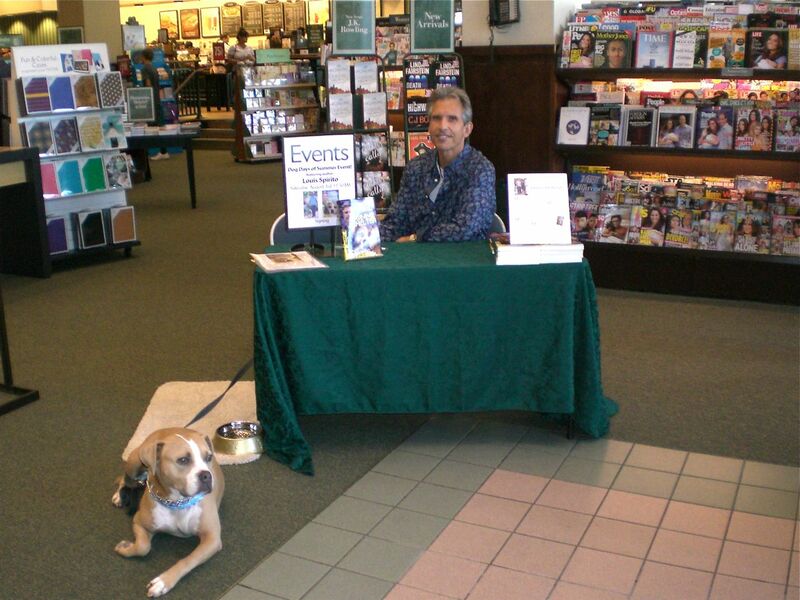 On Saturday, August 3, he was the star of our hugely successful Barnes & Noble book signing in Thousand Oaks. He was friendly, sweet and so well-behaved, even when other dogs cruised by. People adored him and stopped to trade dog stories and to buy GIMME SHELTER. 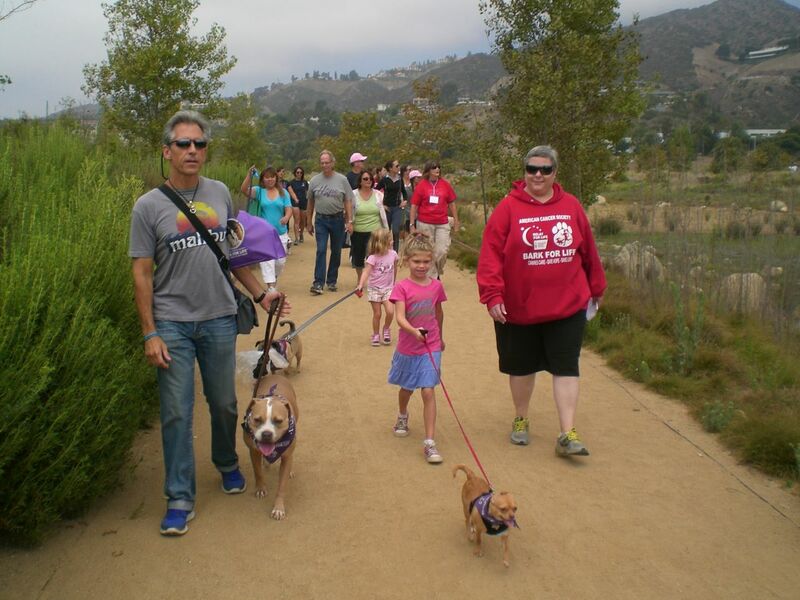 Then on Sunday, August 4, Tanner was back at it again, helping me serve as Grand Marshal and kicking off the fundraising walk at the American Cancer Society ‘Bark For Life’ event. Luckily it was overcast and cool, so he didn’t poop out on a very short stroll. As a reward for his PR efforts, Tanner got to scarf down some rare roast beef and to cuddle all night on the bed. By popular request, here’s the text of the welcome speech we gave. “Dealing with cancer is challenging on many levels. It is stressful, it’s frightening but it can also empowering. One thing that helps us cope with the struggle is the support of our friends, our families, caring strangers and our dogs. 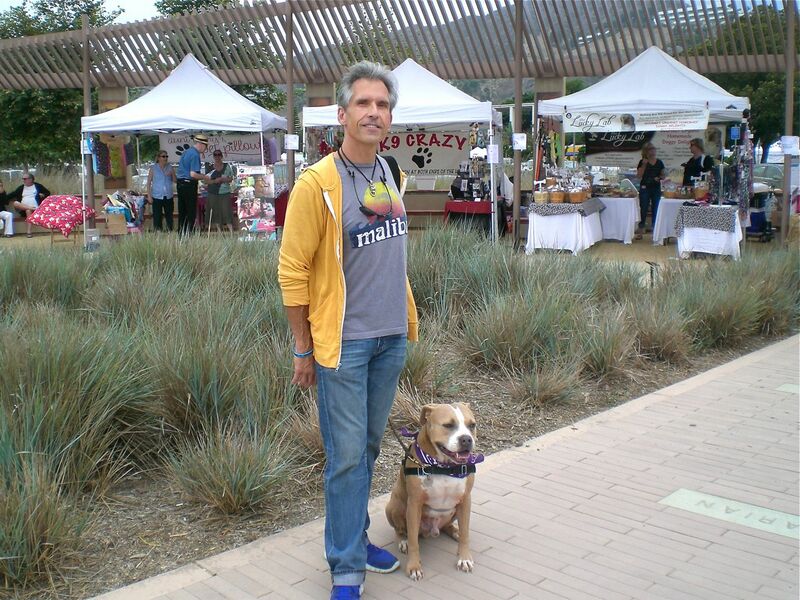 Given that this Malibu’s first annual BARK FOR LIFE fundraising walk, I should say especially our dogs. As someone who has grappled with cancer and other serious issues, I’ve seen firsthand the difference a 4-legged therapist can make. That’s why I’m here today…to speak about how dogs help comfort and heal us when we need it most. 1) THEY ARE CHEAPER THAN DOCTORS AND THERAPISTS, MORE FUN AND ALWAYS ON CALL.– That’s why they make such great healers. We know they will be there for us no matter what. They don’t care if we have insurance, and for most of us, their ‘fee’ is some cuddles and a rawhide treat or two…or five. 2) DOGS DON’T JUDGE – Except when it comes squeaky toys, they don’t judge. They don’t care if you lose weight, gain weight, have more hair, less hair or no hair. They don’t care about our jobs, the cars we drive or the clothes we wear. To our dogs, we have no flaws. We’re perfect just the way we are. They love us because that’s what they do. Period. All they ask from us in return is a little exercise and affection. if only all of our two-legged pals were so easy and accommodating. unruly kindergartners, or we’re feeling like we’ve been run over by a cement truck – our dogs are always up for play. We can take a lesson from them and when things get stressful, or seem hopeless, we can go for a ride and stick our head out the car window, or go for a run, a walk or just sit on a bench in the sun. Your dog never looks at you and says ‘We really need to work more’. Lou & Tanner with Bark for Life organizer Laura Leonard and her rescue dog Barkley. ← FIRE YOUR TRAINER, AND GET A DOG!